2164. 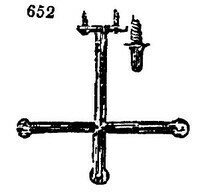 The fixed rafter-trellis consists ordinarily of three wires, which pass through the points of crosses (fig. 652. ), in breadth from 14 to 18 inches, and which crosses are screwed to the under edge of the rafter; the first fixed at the plate of the parapet, the last at the upper end of the rafter, and the intermediate ones at distances of from 3 to 4 feet.